Retirement after a lifetime of work and saving is a major achievement. 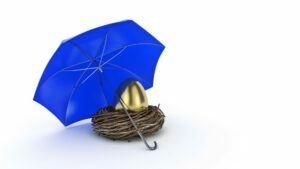 However, too many people believe their nest egg will weather any storm. If only that were true! The fact is that leaving the world of work means entering a whole new sphere of financial responsibility. This new horizon requires the perpetual safeguarding of your wealth and estate, and there are questions to consider when drafting an airtight approach. Will your estate plan protect the assets going to your children and grandchildren? Will the assets stay in the family bloodline? Perhaps you’re uncertain that a previously-drafted plan still adheres to modern estate planning law. Let’s examine how to build a retirement plan that protects your wealth and your legacy. Learn how to determine the income you’ll need, craft smart investment strategies, and mitigate risk while ensuring your heirs are securely provided for. Determining the income required for retirement is crucial. There are a few key steps, such as replacing the commonly-used 70%-90% of your income benchmark or the 4% Rule (more on that below). The problem with any rules of thumb is that everybody has a different fingerprint. Your needs and wants may differ greatly from the next person. You don’t want to view your retirement savings loosely as “fun money” or frugally as an emergency fund. A great way to begin is a retirement budget consisting of a realistic projection of necessary/predictable expenses (such as utilities and medical care) and voluntary expenses (such as vacations, gifts or hobbies). The latter areas are likely where you’ll spend the most; leisure should be the heart of retirement, after all. You will want to pass along an inheritance to your children but too many retirees believe their work is done once an estate plan is set. The unfortunate truth is that wealth may not always endure protecting your heirs as you originally intended. Retirees must be sober about legacy risks. Several factors exist which can threaten your heirs. Divorce. Claims from creditors. Lawsuits. These and more can devastate the wealth you leave for your children and grandchildren. It’s a hard fact that some retirees may not much care for those outside their bloodline, like a son- or daughter-in-law. True peace of mind, under those circumstances, comes from knowing that only your direct descendants will financially benefit from your legacy. Simply leaving a will often also has some downsides: it goes to probate and entails an expensive and time-consuming public disclosure of your assets and heirs – and probate can cost up to 5% of your estate’s total value. We work with estate planning attorneys whose goal is to safeguard your assets and ensure they pass only to your desired beneficiaries. We aid our clients in doing this by coordinating with an attorney to establish a Dynasty Trust: a secure, multi-generational provision that provides only for your intended heirs. Every retiree wants their wealth to weather hard market turns, and it pays to avoid “unsuitable” retirement investments. An unsuitable investment happens when a broker fails to act in their client’s best interests by recommending inappropriate, risky investments; this is a direct breach of Financial Industry Regulatory Authority (FINRA) Rule 2111. An example might be recommending high exposure to risky stocks when other products, such as institutional mutual funds or a Fixed Index Annuity, may offer a more long-term, conservative retirement option. We recommend starting with a portfolio risk analysis to determine the current level of danger your assets are exposed to. With that data in place, you’re in a better position to handle market shifts and make informed future decisions on Individual Retirement Account (IRA) and insurance strategies. Knowing what you’re paying in retirement fees prevents a potentially big dent in your savings. These fees aren’t always obvious. Even when they are, many retirees incorrectly consider the costs nominal. Even the most “reasonable” fees can significantly weaken your wealth by lowering your return. Revenue sharing plans can also cost you if a broker-dealer is compensated for selling a certain type of mutual fund – one that may be too risky or simply have high fees. That fund pays the broker-dealer extra for selling it. Our clients avoid this by having access to institutional mutual funds and ETFs (Exchange-Traded Funds) that have no revenue-sharing deals. Refer to this valuable resource from the SEC for more sound advice on avoiding common mistakes. And, as absurd as it sounds, not passing away may cause you problems. Bear with us as we explain this! Many retirees are free of work stress which reaps huge health benefits; medical care has improved; and people simply live longer, in general, these days. Greater longevity than you may have planned for may cause your needs to exceed your savings. How best to spend in retirement? Past research concluded that no retirement portfolio with a 4% annual withdrawal was exhausted in less than 33 years. This method worked best if retirees kept pace with inflation by allowing a 2% yearly increase in their spending; the Federal Register’s target inflation rate. However, with interest rates so low, perhaps even that 4% rule should be questioned. It’s a limiting and inflexible spending model which makes retirement restrictive – most retirees still have 80% of their savings intact after decades of retirement. In addition, it fails to consider the changing average human lifespan, the unique needs of a retiree, and market shifts. Medical fees in later life may alone be enough to invalidate the 4% approach. Our clients benefit from assistance with planning for potential long-term health care needs and staying informed on the newest care options. At Stuart Estate Planning Wealth Advisors, your future comes first. We offer full-service financial planning and retirement strategies and we make a strong personal investment in our clients. 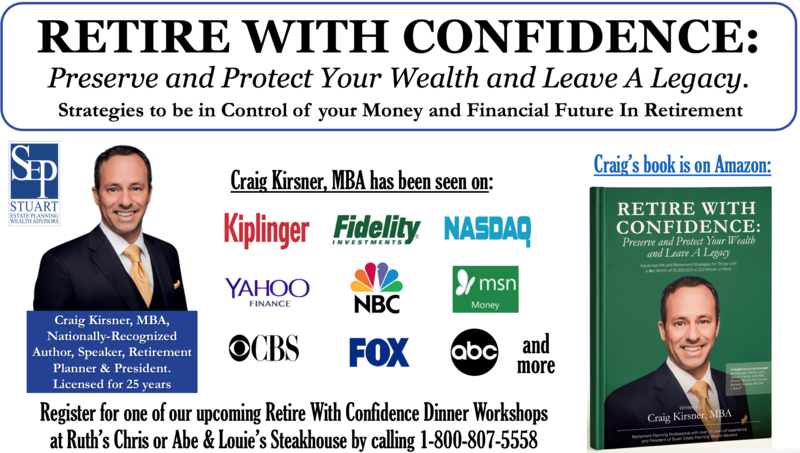 Contact us at assist@stuartplanning.com or call 1-800-807-5558 to sign up for an upcoming retire with confidence dinner workshop at Ruth’s Chris or Abe & Louie’s Steakhouse in Boca Raton or Fort Lauderdale.